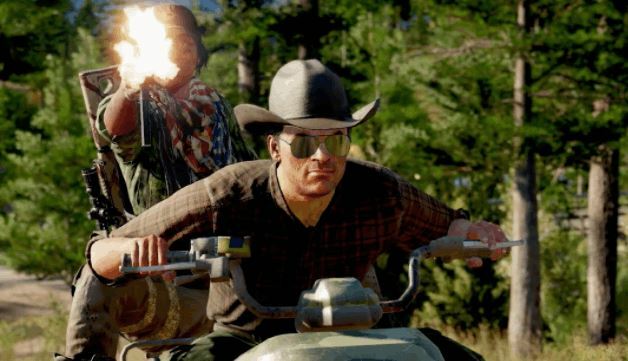 Far Cry has come Stateside. 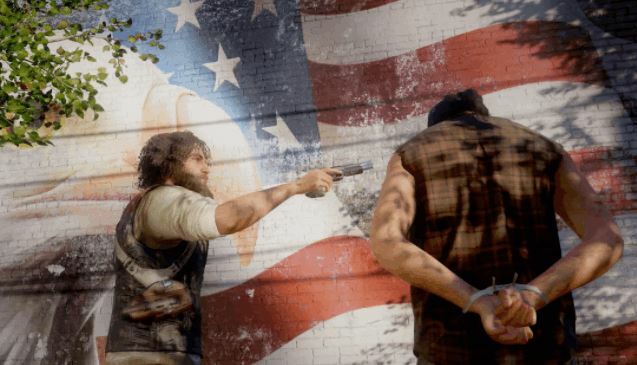 Montana–and within it the fictional region of Hope County–is the setting of a story involving domestic terrorism driven by religious fanaticism. Don’t expect urban warfare; this is a rural battleground spacious enough that planes now have room to fly in a Far Cry experience. It’s one of the 13 things we learned from this week’s reveal of Far Cry 5. 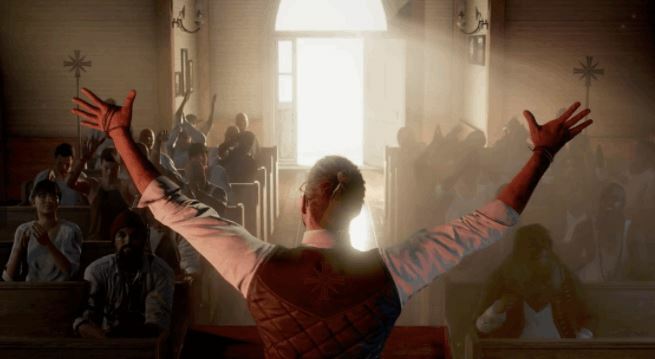 What’s more striking than a Far Cry set in the United States is that the antagonists are a group of religious cultists known as Eden’s Gate. Judging by the trailer footage, the cult is imposing their will and influence on this land. 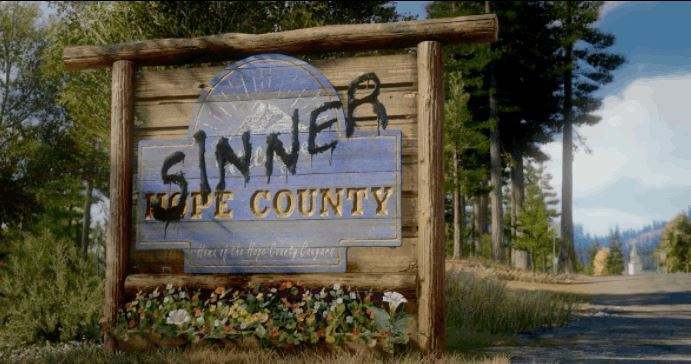 The trailer is littered with Eden’s Gate followers, many of whom are roaming Hope County in pickup trucks, converting the locals to the cult, often forcibly. A bible-wielding preacher gets considerable screen time in this trailer, with the seven deadly sins carved into his skin. He looks like a formidable henchman. The leader of Eden’s Gate goes by the name of Father Joseph. His elder son, Jacob, is a delusional ex-military type, while his younger son, John, is the cult’s lawyer. Rounding out the immediate family is Faith, the half-sister, who has been described as the cult’s “pacifier.” Surely she’s learned a thing or two about the effectiveness of calm and soothing public speaking from Father Joseph. The presence of a resistance implies that Hope County hasn’t been completely taken over by Eden’s Gate. The key members include a pastor named Jerome, a bartender named Mary, and a pilot named Nick. If their roles are anything like the freedom fighters of the prior games, they’ll be happy to support your playable protagonists. That said, do these similarities with other Far Crys indicate that the series’ formulaic shortcomings will again rear their head? It wouldn’t be a proper Far Cry game without a host of vehicles to make the massive open world easier to traverse. 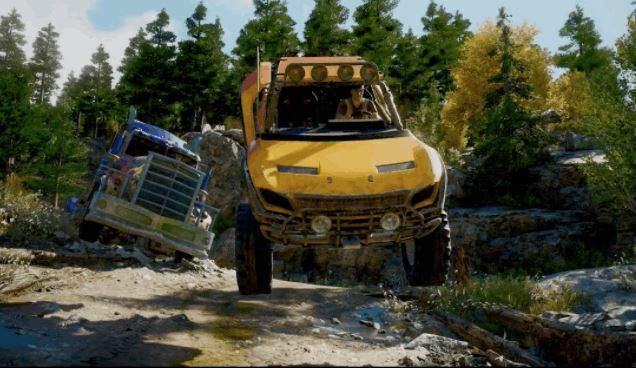 Seen in the trailer were helicopters, pick-up trucks, tractor trucks, and off-road four-wheelers. 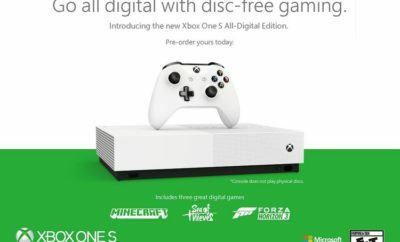 If it’s anything like the previous games, picking a set of wheels will be less about personal preference and more about what is closest to you. 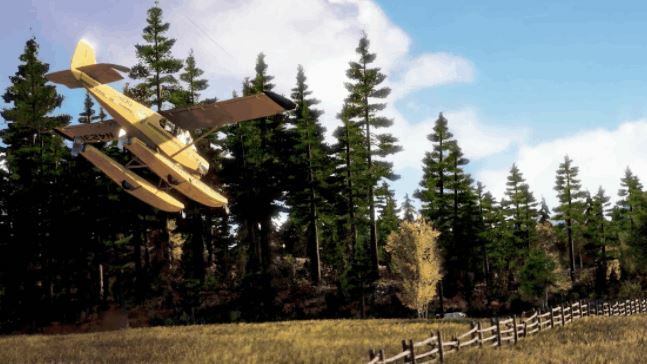 Flying vehicles aren’t new to Far Cry, but planes are. Given the open fields of Hope Country, there look to be many areas where you can take off and land. In addition to dogfighting, one thing the trailer did not show are opportunities for bombing runs. Compared to the exotic locales of the Rook Islands and the Himalayas, Montana is a stark contrast. It will be intriguing to see the specific style of game design that began with Far Cry 3 transposed into Hope County. 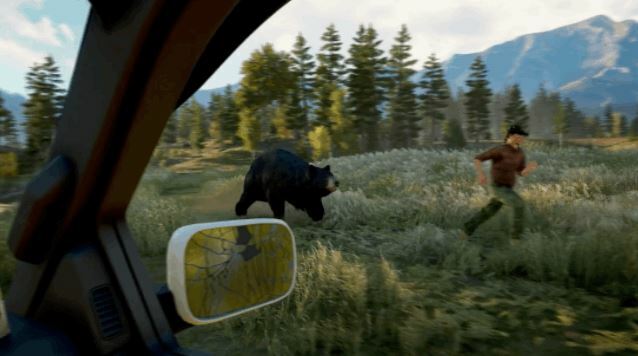 While gameplay videos haven’t been shown to the public yet, we can attest that Far Cry 5 will retain some elements of the recent installments’ user interface like the detection ring. The footage and screens released to date have driven home the fact that a lot of combat will take place in open farmland. Still, we’re eager to see what other types of areas you’ll be able to explore in Eden’s Gate. The nearby forests and lakes would be prime and scenic locales for a firefight. 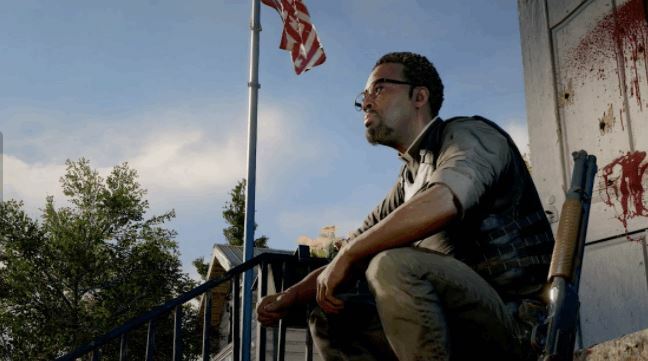 Far Cry 5’s setting puts into perspective the amount of zombie games set in rural America and how refreshing it is to not have to deal with the undead this time. 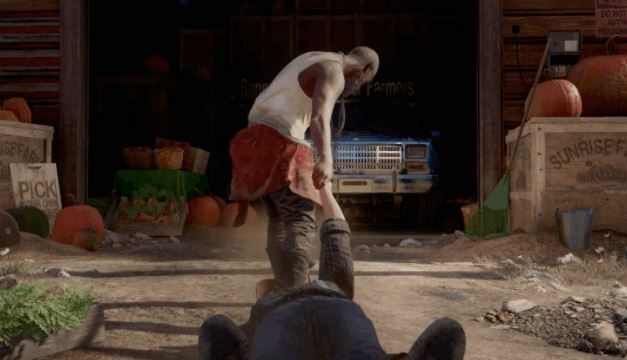 That said, we wouldn’t object to a zombie-themed Far Cry 5 DLC. Cooperative play was one of the high points of Far Cry 4, so it’s not surprising that this feature makes a return in Far Cry 5. You’ll even be able to experience the entire story with a friend. Hopefully, the narrative will feature subtle changes depending on whether you play solo or multiplayer. Customized characters in 2017 are commonplace in shooters but unusual for Far Cry. Some scenes in the trailer give us hints of what your protagonist can look like from the clothes they wear to their skin colors. 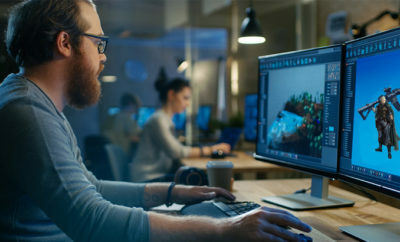 It remains to be seen what range of personalities they will have–if any–when placed in the context of the story and cutscenes. Surviving in any Far Cry game means being resourceful. That not only involves amassing a personal arsenal accessible through a weapon wheel but also improvising in an evolving combat situation by taking advantage of your environment. 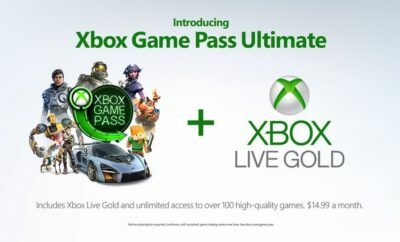 Grab a nearby pitchfork, pull off a drive-by using a slow moving tractor, or lure an enemy toward the horns of a bull. Speaking of wild animals, Hope Country will play host to much of the local fauna you’ll find in a state like Montana. Along with bulls, we noticed cows, bears, and dogs. While some will surely be hostile toward you, there should be a wealth of opportunities to use this aggression toward Eden’s Gate. 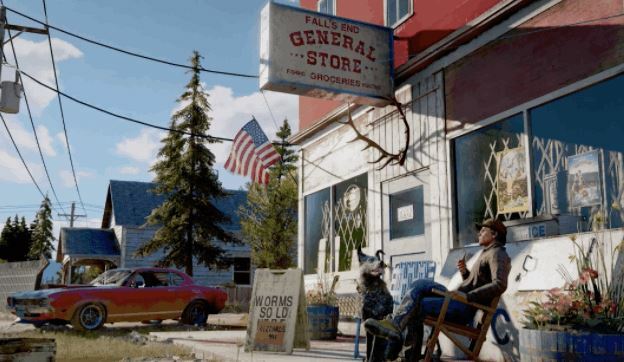 Dogs have been the ‘it’ animal buddies in games for the last several years, and they’re a perfect fit for Far Cry 5’s Montana, whether they be friend or foe. While not shown publicly, we have seen depictions of dogs attacking enemies and even grabbing guns from your foes. Of the many ways Far Cry 5 feels ambitious, its themes and messages will be under the most scrutiny, even more than any new gameplay mechanics it introduces to the series. Eden’s Gate looks to serve as a reflection of a religious vocal minority dissatisfied and disillusioned by the federal government, but will this cult ultimately be reduced to shallow caricatures? 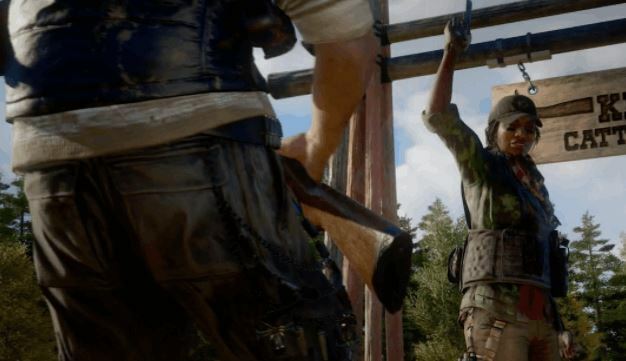 Will there be a disconnect between the dark themes of a country that’s lost its way and joyful gratification one gets from an emergent gameplay shooter like Far Cry? 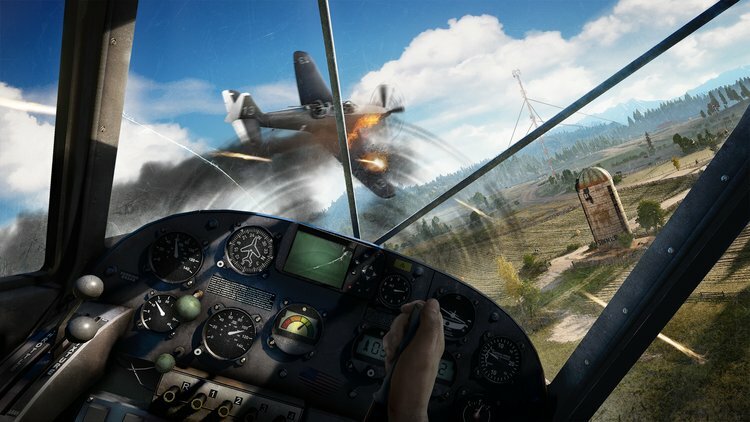 We’ll find out early next year when Far Cry 5 comes out on February 27, 2018, for PC, PS4, and Xbox One.